A great route on small holds- if you are short, there are still plenty of holds, but they get even smaller... Climb up the good face past sustained crimping just left of a huge pillar with an OW behind it and continue to a 2-bolt anchor placed just where the holds start getting big. This route is immediately right of the "Trash Compactor" a large, rectangular rockhouse with a slab at the back and a huge roof above. The face on the right side of the inset bears a single bolted route called "Straight Edge." Formerly 3 or 4 bolts with some sketchy gear, now 6 bolts. Tomasz cruises his way to the chains. Tackle easier ground on small holds for most of the route before a definitive crux two clips from the chains. There are two small crimps which were very difficult to use breaking into the grade. These were avoided by a large deadpoint move. Great route, crimpy fun from bottom to top. 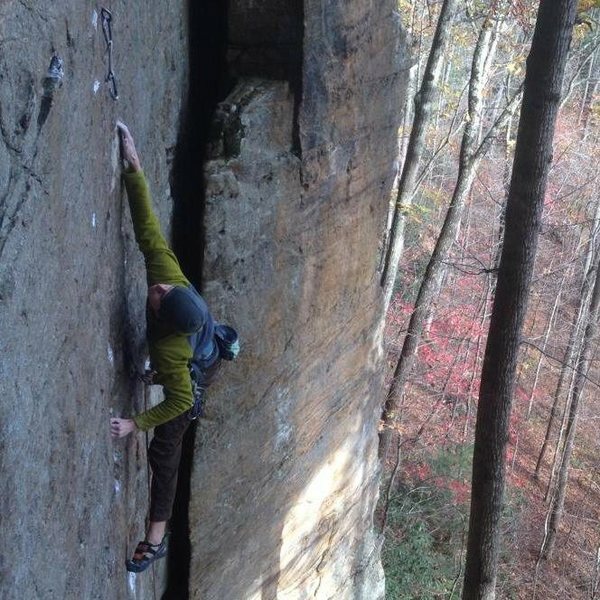 Skipping the 'too small to use' holds.